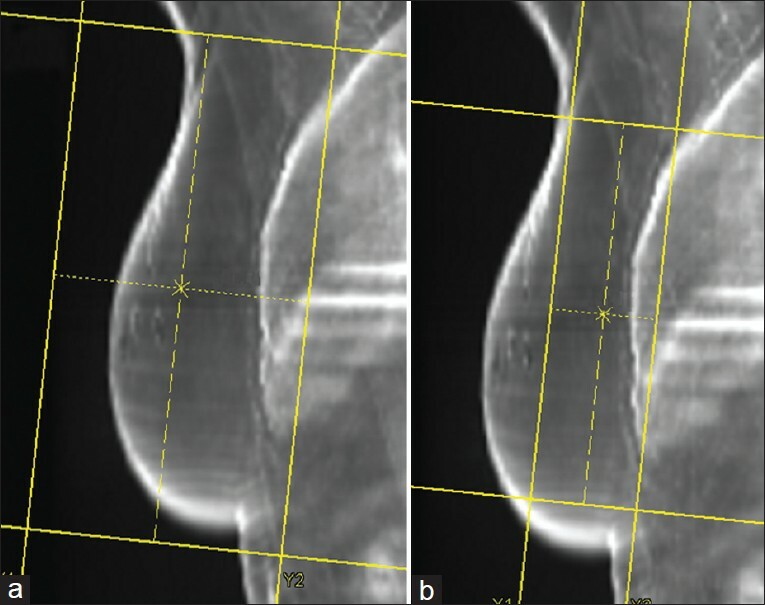 Aim of this study was to compare the dosimetric aspects of whole breast radiotherapy (WBRT) between an irregular surface compensator (ISC) and a conventional tangential field technique using physical wedges. Treatment plans were produced for 20 patients. The Eclipse treatment planning system (Varian Medical Systems) was used for the dose calculation: For the physical wedge technique, the wedge angle was selected to provide the best dose homogeneity; for the ISC technique, the fluence editor application was used to extend the optimal fluence. These two treatment plans were compared in terms of doses in the planning target volume, the dose homogeneity index, the maximum dose, ipsilateral lung and heart doses for left breast irradiation, and the monitor unit counts required for treatment. Compared with the physical wedge technique, the ISC technique significantly reduced the dose homogeneity index, the maximum dose, the volumes received at 105% of the prescription dose, as well as reducing both the ipsilateral lung and heart doses (P < 0.01 for all comparisons). However, the monitor unit counts were not significantly different between the techniques (P > 0.05). Thus, the ISC technique for WBRT enables significantly better dose distribution in the planning target volume. Trigeminal neuralgia (TN) is treated in CyberKnife (Accuray Inc, Sunnyvale, USA) with the 5 mm collimator whose dosimetric inaccuracy is higher than the other available collimators. The 7.5 mm collimator which is having less dosimetric uncertainty can be an alternative for 5 mm collimator provided the dose distribution with 7.5 mm collimator is acceptable. Aim of this study is to analyze the role of 7.5 mm collimator in CyberKnife treatment plans of TN. The treatment plans with 5 mm collimators were re-optimized with 7.5 mm collimator and a bi-collimator system (5 mm and 7.5 mm). The treatment plans were compared for target coverage, brainstem doses, and the dose to normal tissues. The target and brainstem doses were comparable. However, the conformity indices were 2.31 ± 0.52, 2.40 ± 0.87 and 2.82 ± 0.51 for 5 mm, bi-collimator (5mm and 7.5 mm), 7.5 mm collimator plans respectively. This shows the level of dose spillage in 7.5 mm collimator plans. The 6 Gy dose volumes in 7.5 mm plans were 1.53 and 1.34 times higher than the 5 mm plan and the bi-collimator plans respectively. The treatment time parameters were lesser for 7.5 mm collimators. Since, the normal tissue dose is pretty high in 7.5 mm collimator plans, the use of it in TN plans can be ruled out though the treatment time is lesser for these 7.5 mm collimator plans. This analysis evaluates the feasibility and dosimetric results of a simplified intensity-modulated radiotherapy (IMRT) treatment using a cobalt-therapy unit for post-operative breast cancer. Fourteen patients were included. Three plans per patient were produced by a cobalt-60 source: A standard plan with two wedged tangential beams, a standard tangential plan optimized without the use of wedges and a plan based on the forward-planned "field-in-field" IMRT technique (Co-FinF) where the dose on each of the two tangential beams was split into two different segments and the two segments weight was determined with an iterative process. For comparison purposes, a 6-MV photon standard wedged tangential treatment plan was generated. D mean , D 98% , D 2% , V 95% , V 107%, homogeneity, and conformity indices were chosen as parameters for comparison. Co-FinF technique improved the planning target volume dose homogeneity compared to other cobalt-based techniques and reduced maximum doses (D 2% ) and high-dose volume (V 110% ). Moreover, it showed a better lung and heart dose sparing with respect to the standard approach. The higher dose homogeneity may encourage the adoption of accelerated-hypofractionated treatments also with the cobalt sources. This approach can promote the spread of breast conservative treatment in developing countries. The objective of this study is to check the feasibility of in vivo rectal dose measurement in intensity-modulated radiotherapy (IMRT) and CyberKnife treatments for carcinoma prostate. An in-house pelvis phantom made with bee's wax was used in this study. Two cylindrical bone equivalent materials were used to simulate the femur. Target and other critical structures associated with carcinoma prostate were delineated on the treatment planning images by the radiation oncologist. IMRT treatment plan was generated in Oncentra Master Plan treatment planning system and CyberKnife treatment plan was generated in Multiplan treatment planning system. Dose measurements were carried out in phantom and in patient using Gafchromic EBT3 films. RIT software was used to analyze the dose measured by EBT3 films. The measured doses using EBT3 films were compared with the TPS-calculated dose along the anterior rectal wall at multiple points. From the in-phantom measurements, it is observed that the difference between calculated and measured dose was mostly within 5%, except for a few measurement points. The difference between calculated and measured dose in the in-patient measurements was higher than 5% in regions which were away from the target. Gafchromic EBT3 film is a suitable detector for in vivo rectal dose measurements as it offers the possibility of analyzing the dose at multiple points. In addition, the method of extending this in vivo rectal dose measurement technique as a tool for patient-specific quality assurance check is also analyzed. 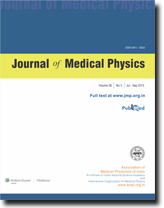 The objective of this work was to investigate and quantify the effect of sharp edges of the phantom on the point dose measurement during patient-specific dosimetry with Rapid Arc (RA). Ten patients with carcinoma of prostate were randomly selected for this dosimetric study. Rapid Arc plans were generated with 6 MV X-rays in the Eclipse (v 8.6.14) with single arc (clockwise). Dosimetry verification plans were generated for two phantoms (cylindrical and rectangular). The cylindrical phantom was solid water (diameter 34 cm) and the rectangular phantom was a water phantom (25 cm × 25 cm × 10 cm). These phantoms were pre-scanned in computed tomography (CT) machine with cylindrical ionization chamber (FC65) in place. 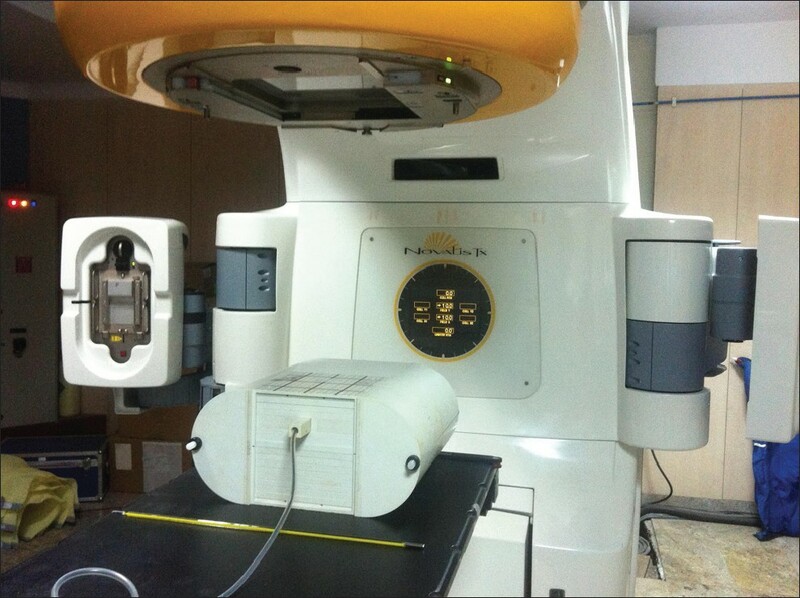 The plans were delivered with Novalis Tx linear accelerator with 6 MV X-rays for both the phantoms separately. The measured dose was compared with the planned dose for both the phantoms. Mean percentage deviation between measured and planned doses was found to be 4.19 (SD 0.82) and 3.63 (SD 0.89) for cylindrical and rectangular phantoms, respectively. No significant dosimetric variation was found due to the geometry (sharp edges) of the phantom. The sharp edges of the phantom do not perturb the patient specific Rapid Arc dosimetry significantly. In high dose rate (HDR) brachytherapy, the source dwell times and dwell positions are vital parameters in achieving a desirable implant dose distribution. Inverse treatment planning requires an optimal choice of these parameters to achieve the desired target coverage with the lowest achievable dose to the organs at risk (OAR). This study was designed to evaluate the optimum source step size and maximum source dwell time for prostate brachytherapy implants using an Ir-192 source. In total, one hundred inverse treatment plans were generated for the four patients included in this study. Twenty-five treatment plans were created for each patient by varying the step size and maximum source dwell time during anatomy-based, inverse-planned optimization. Other relevant treatment planning parameters were kept constant, including the dose constraints and source dwell positions. Each plan was evaluated for target coverage, urethral and rectal dose sparing, treatment time, relative target dose homogeneity, and nonuniformity ratio. The plans with 0.5 cm step size were seen to have clinically acceptable tumor coverage, minimal normal structure doses, and minimum treatment time as compared with the other step sizes. The target coverage for this step size is 87% of the prescription dose, while the urethral and maximum rectal doses were 107.3 and 68.7%, respectively. No appreciable difference in plan quality was observed with variation in maximum source dwell time. The step size plays a significant role in plan optimization for prostate implants. Our study supports use of a 0.5 cm step size for prostate implants.